Samsung is one the most selling smartphone brands worldwide. Especially with Their Galaxy Series, they have done pretty much great with the build quality and software stability. But over the time you may want to reset your phone and then unable to open the phone because it is asking you the email id and password that you have forgotten. This guide helps you removing such FRP lock using Samsung FRP tools for free with your own computer and without going to any service center/repair center. Factory Reset Protection ( FRP) is a method by which your phone gets secured when you do the factory reset. When rebooted your phone ask you to log in with your Gmail credentials to use your phone. This FRP secure files are stored in system files and can’t be altered by the regular user. These files get activate when you factory reset the phone and display you a login screen. If you are using multiple Gmail accounts, then use oldest/first used account to unlock your phone. This feature may become a pain to users who forgot their password and they just can’t use their phone anymore. Here comes the Samsung FRP unlock tool which reset your Samsung phones/ Galaxy phone’s FRP lock. This tools resets your FRP lock and gives you back your phone’s access. There are some tools that do this work very easily. This tool is more popular to reset Samsung FRP. Note that this tool is only available to Samsung phones, more likely galaxy devices. This tool just requires one click to reset FRP lock. Extract the zip file and click on Frp Hijacker v1.0.exe file. You should have Microsoft Net Framework 4.5.2 installed if the installation failed. Wait for the software to install. Launch “FRP hijacker tool” on pc as administrator. Connect your Samsung device using the USB cable and wait for the drivers to install. Now, click on scan button to detect the device port. Once done, your device is ready to remove FRP lock. In the FRP HIJACK tab, select your device name by drop-down list and click on download mode. Your device now automatically boot into download mode. Click on Remove FRP option from the tool and click on HIJACK IT button. Wait until the process to finish. Remeber that reboot may take some time, so be patient. Once the device reboots, you can now log in with your new Gmail id. This tool is also helpful for getting your device rescued from FRP lock. Just install this tool and get your device unlocked with a click. Download octopus tool from this link. Now click on Samsung software version 1.6.5 [FULL].exe file. Samsung Octopus is now shown on your PC. Press Vol Up to continue. Open the installed tool and in Support & Options tool and select phone model from the drop-down menu. Click on Reset FRP option. once done, phone now reboots and you now login to your phone using any Gmail account. 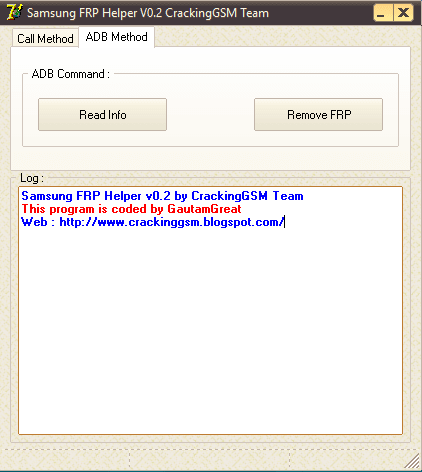 This tool used call method and ADB method to remove FRP lock. just connect your phone and in one click your device can rescue from FRP protection. Download Samsung FRP Helper v0.2 from this link. Now open the Samsung FRP Helper v0.2.exe and wait to install. Open the tool and click on Reset FRP. Wait for the process to continue. Hope all these methods found you useful and you will able to reset FRP lock of your Samsung phone.